Persoonia are a group of small shrubs to trees suitable for landscaping purposes. The prostrate Persoonia pinifolius is one form, Persoonia chamaepitys and others are useful as well. Wholesale Nurseries stock a number of varieties in sizes from tubestock to advanced plants. The most widely grown species is P. chamaepitys. Reaching less than 20cm in height it makes a good ground cover plant. Upright spikes of foliage on a drought tolerant easy care plant. Used in landscaping where it can be allowed to flow over a rock or a low garden wall. Most popular landscaping varieties are used as ground cover plants. All species are low maintenance requiring little pruning. All are reasonably drought tolerant once established. Use a specialist native plant fertiliser in spring. Persoonia pinifolius – Also known as the Pine Leafed Geebung, this is a large shrub that can reach 3 – 4m in height. The narrow needle like foliage give it the common name. Yellow flowers hang in bracts in summer. 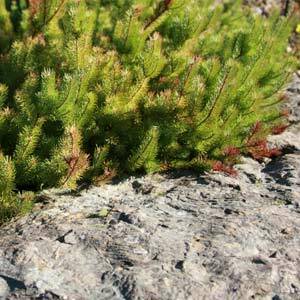 Persoonia chamaepitys – This is a prostrate form sometimes called the ‘Mountain Geebung’. Excellent ground cover plant. Persoonia juniperina – Commonly called the ‘Prickly Geebung’. Relatively low growing to around .75m. Flowers appear in the leaf axils. Persoonia stradbrokensis – Broad leaves and tall growing, more of a small tree reaching around 5m in height. Persoonia lineraris – Narrow leaves and fairly upright in habit, reaching around 3m in height.